Miami to Bahamas Day Trip by plane, is an amazing, truly unforgettable experience. Turquoise waters meet the blue of the sky on the horizons in every direction. White sand beaches with swaying palms in the gently warm breeze frame the picture perfect postcard view. Miami to Bahamas Day Trip by plane, is an amazing, truly unforgettable experience. Turquoise waters meet the blue of the sky on the horizons in every direction. White sand beaches with swaying palms in the gentle warm breeze frame the picture perfect postcard view. With wildlife in abundance both above and below the water, let me share with you this incredible adventure in a world with 50 shades of blue. 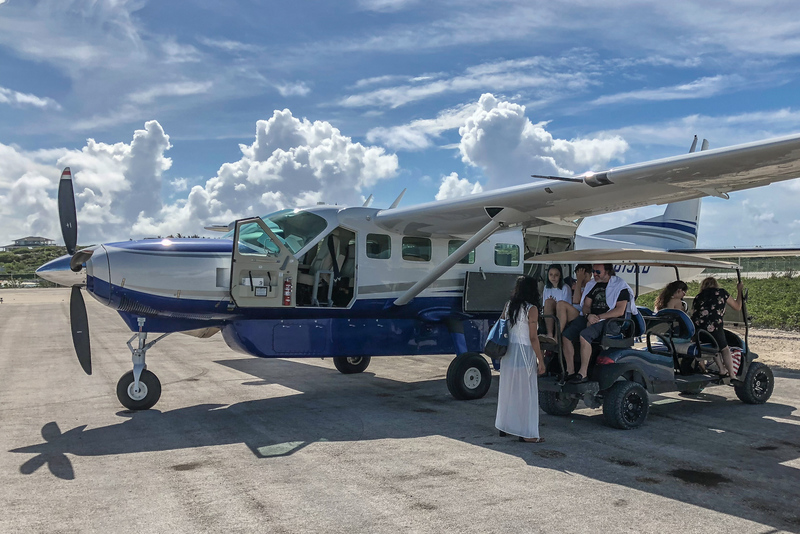 Come take flight with me over the Bahamas Islands, on what has to be one of the ultimate Miami Day Trips and wet your thirst for adventure and exploration. It’s morning. I’m at 11,000ft up. An incredible blue color begins to fill the windows. We’ve been flying across to the Bahamas for just over an hour when gazing out of the plane window my eyes are illuminated with a glimpse of paradise. Small tropical islands inhabit the turquoise blue of the Bahamas Sea. I can see a yacht with it’s sails to the wind. The sea is so clear, it looks as if the boat is hung in space, gliding across a magical surface. 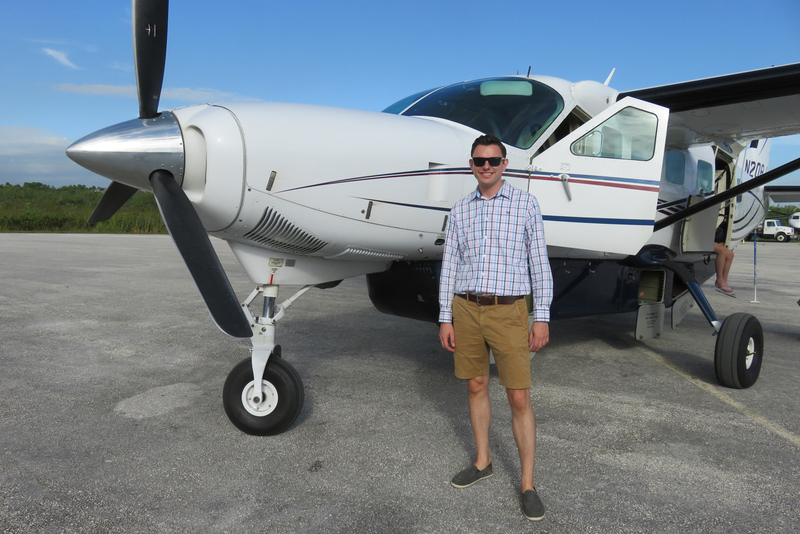 I took to the skies for this once in a lifetime opportunity with Bahamas Air Tours, the World’s first Bahamas Day Trips operator. They provide Trips to Bahamas by plane from Florida, including Miami, Fort Lauderdale and Palm Beach. I’m on their Miami to Bahamas Day Trip which visits the idyllic Staniel Cay Island in the Exuma Cays. There was talk of a new Day Trip to Bahamas from Florida originating in Orlando which would be an exciting addition to the tour itineraries. And they have Bahamas Day Trips from Nassau to Exuma aswell. They are the clear market leader when it comes to the one day cruise to Bahamas market by plane! I’m flying in this stunning Cessna Grand Caravan EX aircraft with a powerful PT-6 turbine engine built by Pratt and Whitney. The Grand Caravan has a luxurious and spacious cabin with seating for upto 9 guests and 1 pilot. The day started early, I had to be at check-in at their private airport lounge at Fort Lauderdale Executive Airport. It’s about a 1 hour drive from South Beach or downtown Miami. After we completed our immigration forms required for entry into the Bahamas we are led to the plane. Even the red carpet is rolled out for us as we board the plane by the small entry ladder at the rear of the aircraft. The flight from Miami to Bahamas is broken down into 2 flight legs. 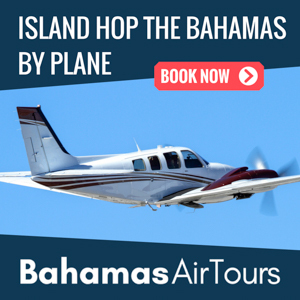 Firstly a 1 hour flight from Miami to Bahamas with a stop on Andros Islands. This is where the tour group officially enters the Bahamas and passes through Bahamas Immigration. After this short tech stop, we board again and take a 45 minute flight from Andros to the Exumas. This is by far the most scenic part of the whole Bahamas Day Trip. 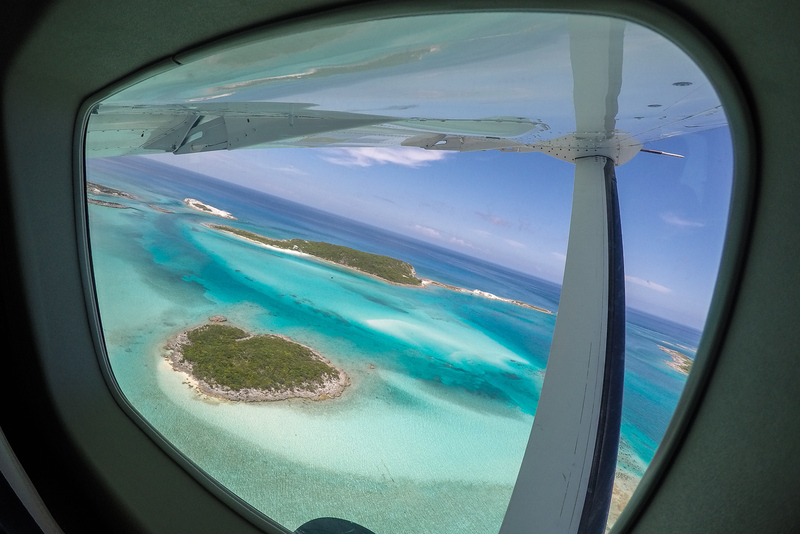 Flying along the Exuma Cays is a magical experience. 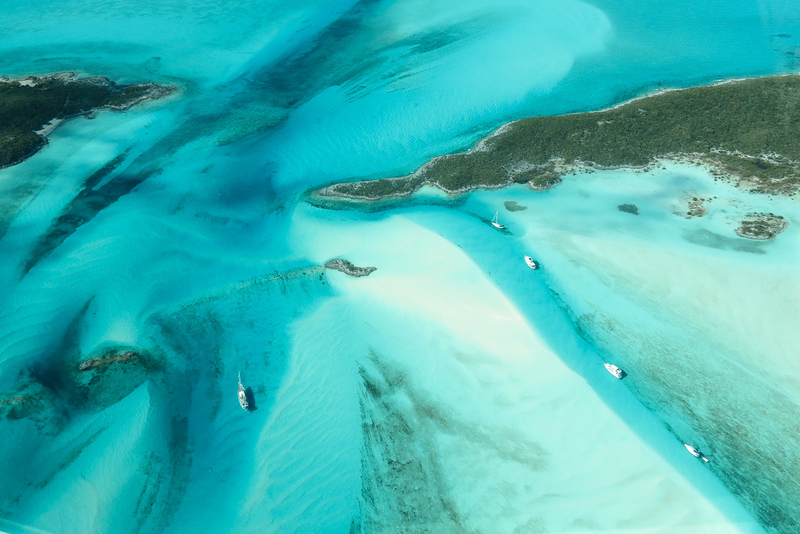 The Exuma Cays are an archipelago made up of around 360 islands. Their destination of this Miami to Bahamas Day Trip is the jewel in the crown of the Bahamas Islands: Staniel Cay. 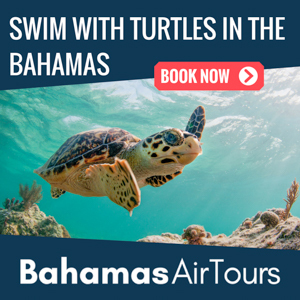 Home to the world-famous Bahamas Swimming Pigs as well as the nurse sharks at Compass Cay, the James bond Thunderball Grotto and the endangered species of Bahamian Rock Iguanas. This truly is an adventure to behold in Paradise. It’s an amazing concept: a Bahamas Cruise from Miami by Plane. No faff or long sea crossings as one would expect on a traditional once day cruise from Miami, but a quick 1 hour flight from Miami to Bahamas and we’re there. 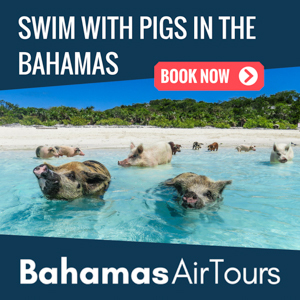 Our first stop on the Miami to Bahamas Day Trip is the famous Swimming Pigs at Pig Beach, also known as the “Exuma Pigs”, “Staniel Cay Pigs” or “Bahamas Swimming Pigs”. The Pig Beach is located on an island called Big Major Cay, its more widely known as Pig Island. This small island, which is dominated by its lengthy beach on the western shoreline is in close proximity to Staniel Cay. It’s only about a 10 minute boat ride from Staniel Cay to Pig Beach with only the Thunderball Grotto island located between. 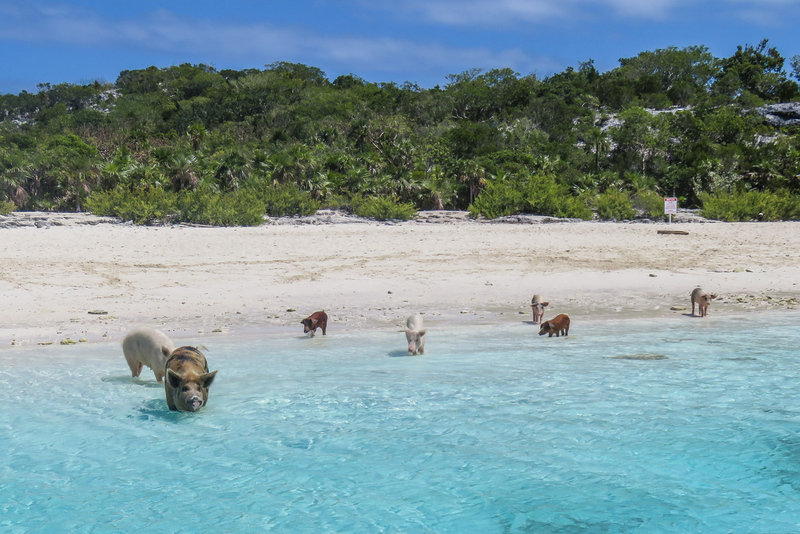 Visiting the Exuma Pigs on a one day cruise to Bahamas surely must one of the top things to do in Miami? As you approach Pig Beach by boat you will begin to see these famous creatures roaming the beach. And as soon as the pigs hear the roar of the boat engine, they’ll all get up and head down to the waters edge. Some will tentatively take steps into the water until just their snouts are sticking up above the water, like snorkels. It’s at this point some of them will begin to swim out to meet you! Legend has it that the pigs were shipwrecked in a storm and swam ashore. Other local stories will have you make believe that they were left here on the Pig Beach by sailors many years ago but failed to return to collect them. The real reason is much simpler but entertaining nevertheless. Many years ago when Staniel Cay was a Farming community, the locals put the Pigs on Big Major Cay, away from the village to avoid the bad smells. Then when the locals used to boat over to the Pig Island to feed them, the pigs would hear the boats, associate the noise with food, and began to swim out to the farmer’s boat in the pursuit of their next meal! You can read more about Pig Beach and the Bahamas Swimming Pigs in my ultimate travel guide to Pig Beach here. It wasn’t long that tourists we first visiting Pig Beach at Staniel Cay that locals saw this as an opportunity to add more attractions in the local area. 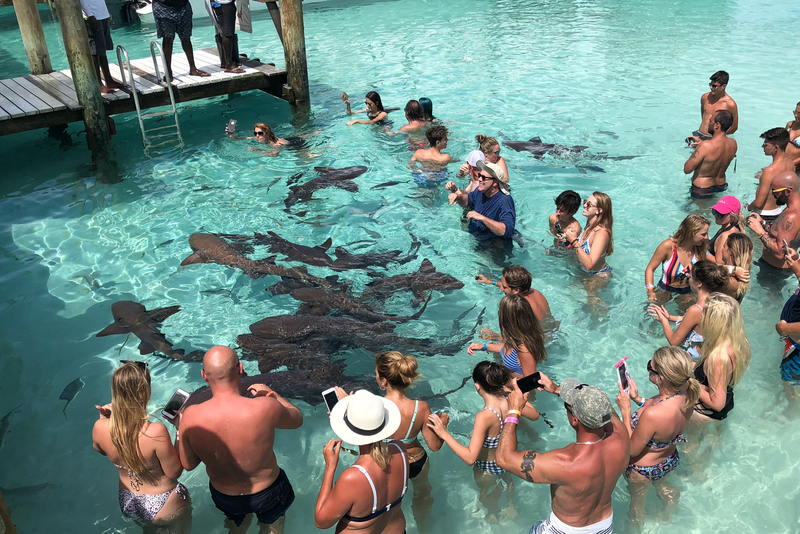 And perhaps now with the likes of Instagram fuelling the desire to have a selfie-photo floating with sharks, it wasn’t long before the popularity of the Nurse Sharks at Compass Cay really took off! 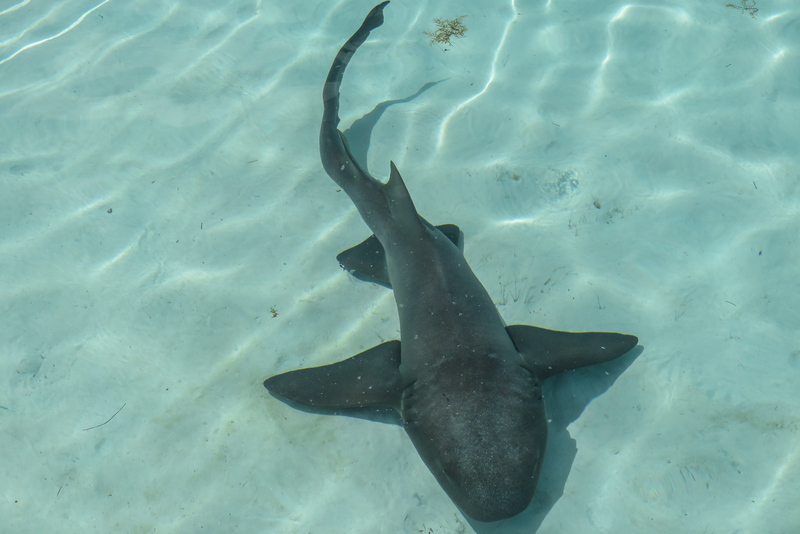 The type of sharks at Compass Cay is called “Nurse Sharks”. The National Geographic describes the Nurse Shark as mostly harmless to humans. Whilst the sharks here at Compass Cay are “pet sharks”, that means the locals have trained them but not quite domesticated them. They do appear sedate and comfortable in the presence of humans though. I was told a number of first hand accounts by locals of pesky tourists getting their fingers nibbled by these sharks, mainly because they decided to put their fingers in or close to their mouths; perhaps not the best of ideas! Compass Cay was certainly crowded during my visit. But this is still crowded in the sense of being crowded in the remote Bahamas Out Islands. It wasn’t exactly queuing for the Christine Chapel in Rome! It didn’t detract from the experience and actually having more people there provided more entertainment with the various ingenious and slightly narcissistic selfie taking poses! 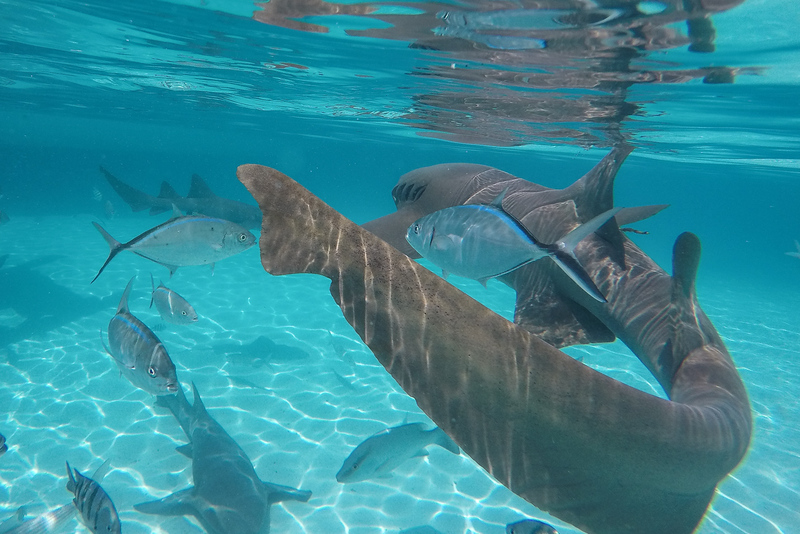 Swimming with the Sharks on a Bahamas Day Trip has to be one of the top things to do in Miami! Now this place really is the epitome of Bahamas Paradise. Walk across this pristine sand bar that reveal’s itself only at low tide. I’ve never quite seen somewhere this stunning before, it’s right out of a James Bond film! The sand bar is located very close to Compass Cay and is in an area known as Pipe Cay. Small sand dollars litter the shallow waters that surround the sand bar at low tide where the water is only ankle deep. And did I mention the temperature of the water? It’s like getting into a warm bath. 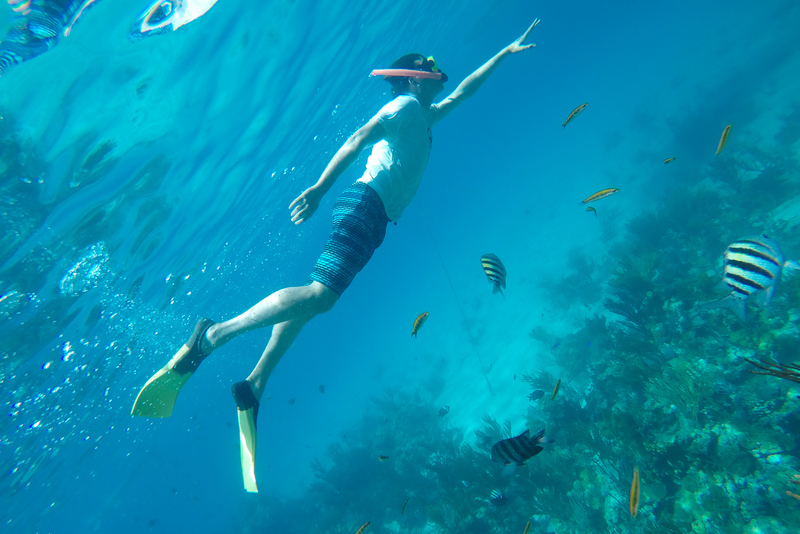 The Bahamas Sea is so shallow and clear that it retains the warmth of the sun’s rays to making swimming in the sea on a Miami to Bahamas Day Trip all the more perfect! What I’ve really enjoyed so far on this Miami Day Trip to Bahamas is the relaxed flow of the itinerary. It’s not been pushy or a sense to go-go-go. We’ve been given plenty of time on the boat excursion at each attraction to experience each unique place and get enough photos to crash the servers at Instagram. 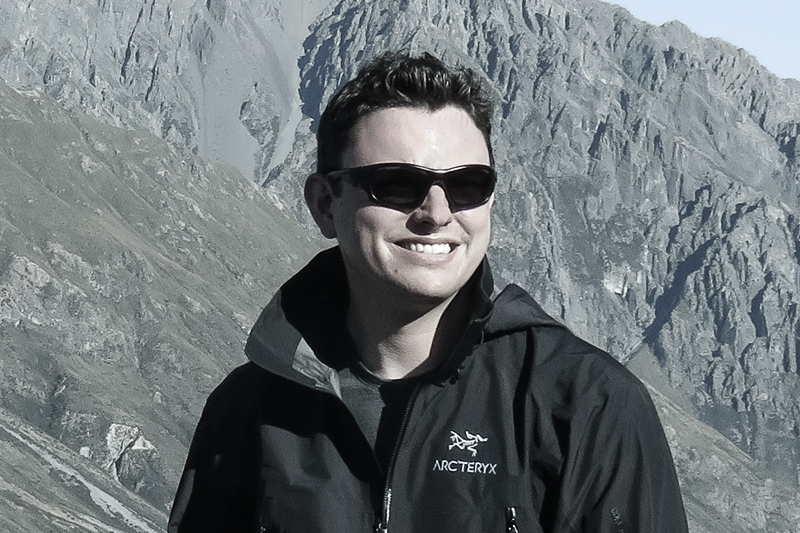 At the end of the article I’ll dive into more depth about the logistics of the tour. This stop on the tour really is authentic James Bond territory. The James Bond Cave or Thunderball Grotto as it is more popularly known is a small underwater cave used as a location on the filming for Sean Connery’s Thunderball Film in 1965. This was the film in which a Vulcan Bomber aircraft crash lands in the ocean; which was a scene they filmed underwater in the Bahamas too, just off the coast of Nassau. Thunderball Grotto is a small hollowed out island with a large cave inside. There are 3 entrances to the cave. One through a skylight in the roof, which requires climbing to the top of the island and jumping in, or two underwater entrances. 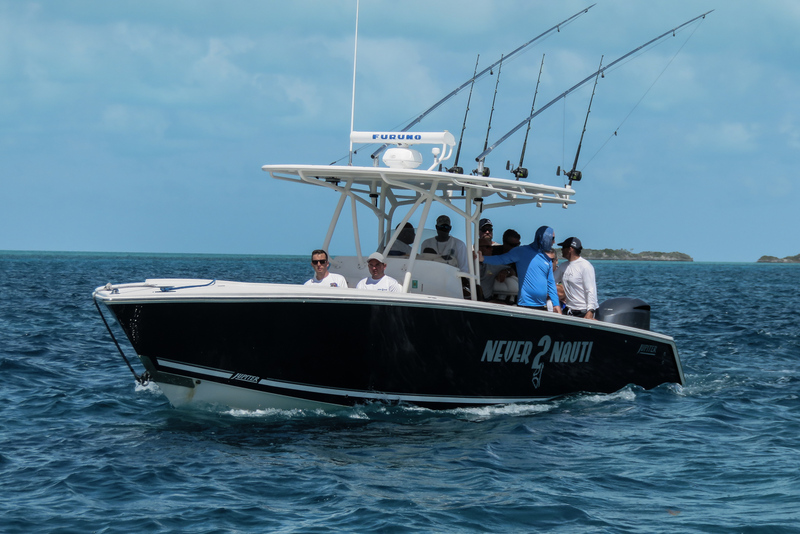 It’s really important to get the correct tide and sea conditions to visit Thunderball safely on a Miami to Bahamas Day trip. The tour guides, who are local Bahamians, are excellent at explaining all the features of the Thunderball Grotto and potential dangers to be aware of. The rocks that surround the cave are razor sharp. If you even put your hand on them for support you’ll get a nasty cut. 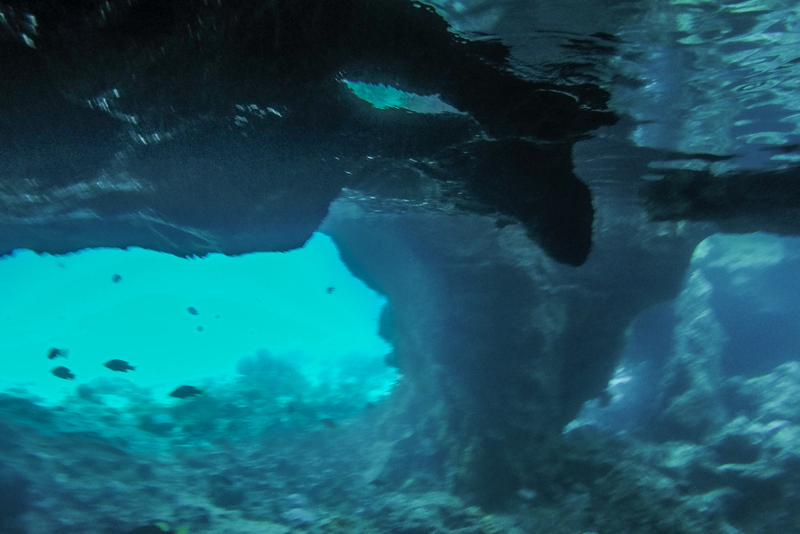 A small passage way that is partially-submerged is the main entrance to the Thunderball Grotto Cave. 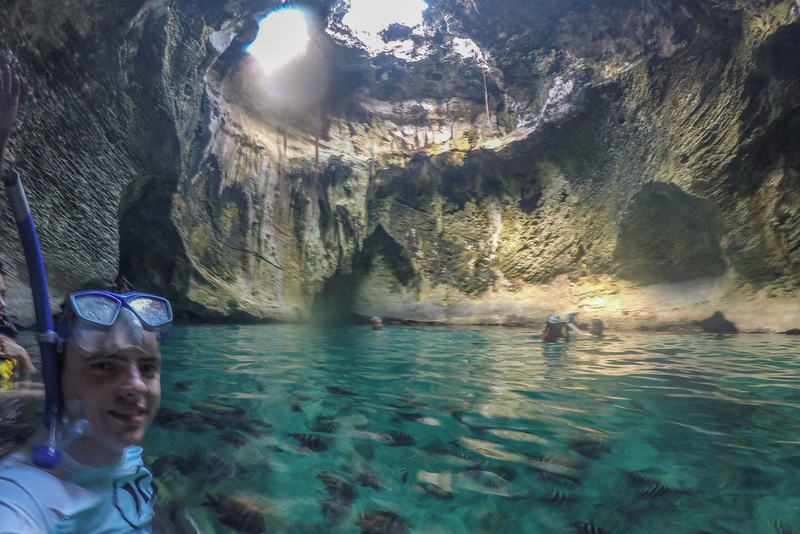 If you’re luck your guide will have bought some fish food, to feed the fish that swim inside the waters of the cave. It’s also a bit or a labyrinth inside the cave especially with the underwater passageways and you can see how easy it would be to get lost and risk drowning! Inside the Thunderball Grotto cave its actually very light because of the large skylight in the roof above. The rocks inside the cave are less sharp than those on the outside, I guess because there is less wave action and erosion inside. There is a small ledge that runs around the inside rim of the cave that you can climb onto to get better photographs out of the water. 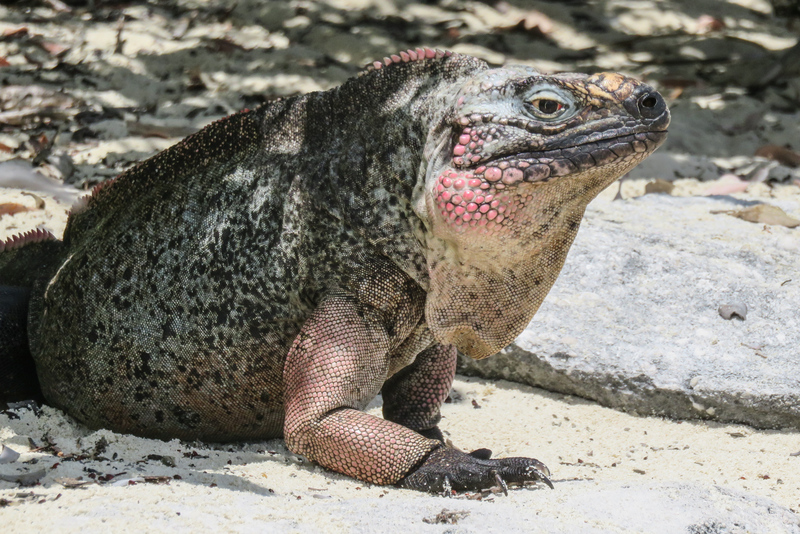 The Bahamian Rock Iguanas are an endangered species of Bahamian Rock Iguana. They live in this sheltered habitat on the island of Bitter Guana Cay. A thin line of vegetation surrounds the beach and rising cliffs. 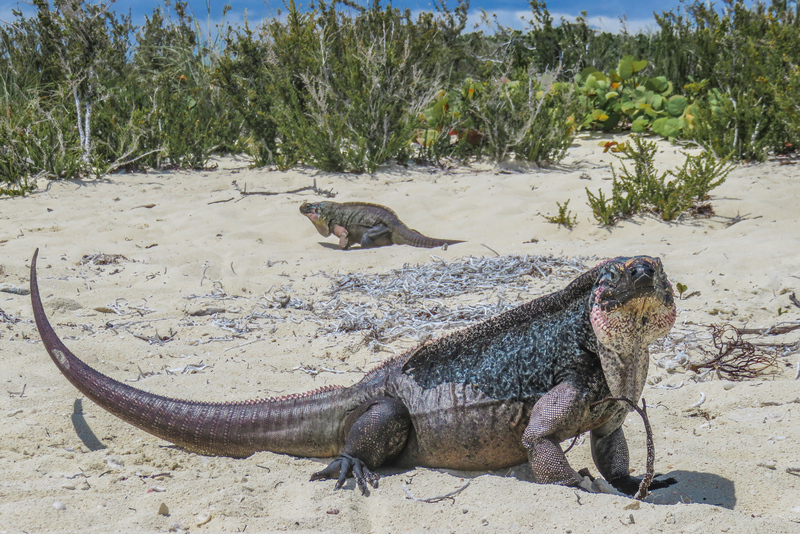 There are warning notices along the beach that make it explicitly that you should not venture behind the beach at risk of collapsing the protected nests of the endangered Bahamian Rock Iguanas. This is a really unique stop on the Miami to Bahamas Day Tour. As the Staniel Cay Tour boats from Nassau don’t venture this far south of Staniel Cay, its almost guaranteed that you’ll get the beach at Bitter Guana Cay all to yourselves. 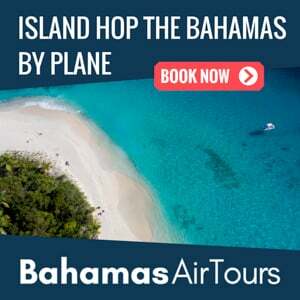 I think this is another reason for the appeal of this type of Bahamas cruise from Miami by plane, because you get transported to these unique and remotely beautiful places of the Bahamas Out Islands. It almost feels like you’re on a real life “Jurassic Park” adventure with these ancient beasts roaming the beach here. The first thing to note here is that the Turtles at Farmers Cay are not a guaranteed stop as part of the standard Miami to Bahamas Day Trip. Its considered an “off-the-beaten” track added extra, if your group make it through the Staniel Cay Day Trip with enough spare time. 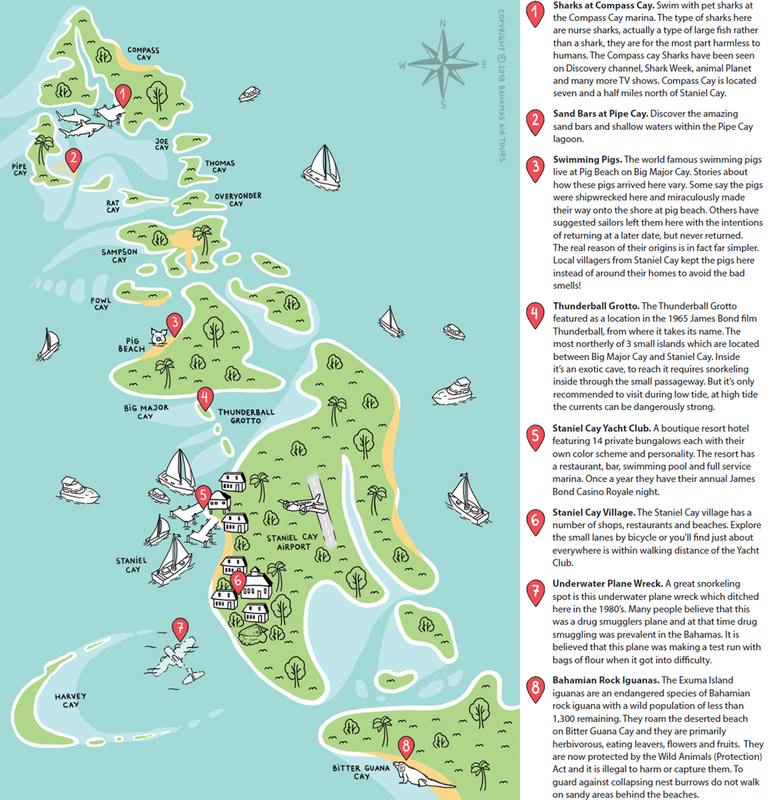 Farmers Cay is around 30 minutes due south of Staniel Cay, so it takes a while to get there and back. The views as we powerboat down through the Exuma Cays are still astonishing. 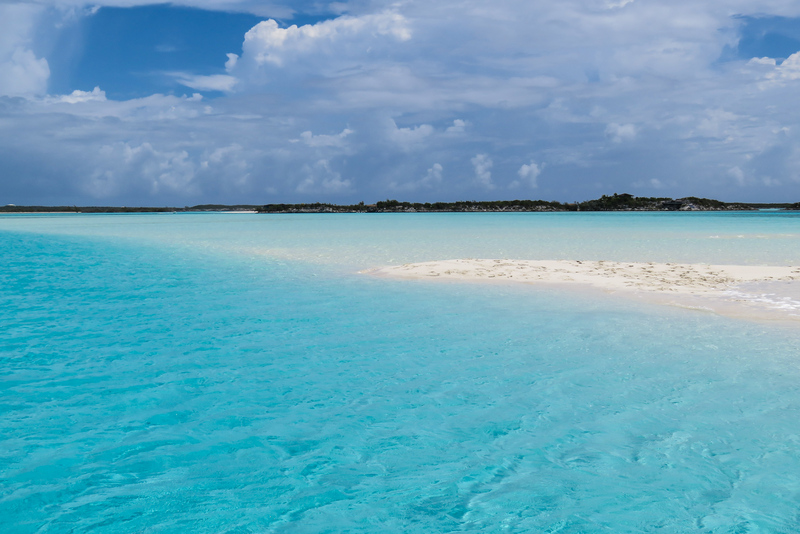 Private islands, resorts and pristine beaches pass by on the journey from Staniel Cay. The dock at Farmers Cay is run by some locals and they prepare fresh conch here. But its not just turtles that I encountered on my visit to Farmers Cay. 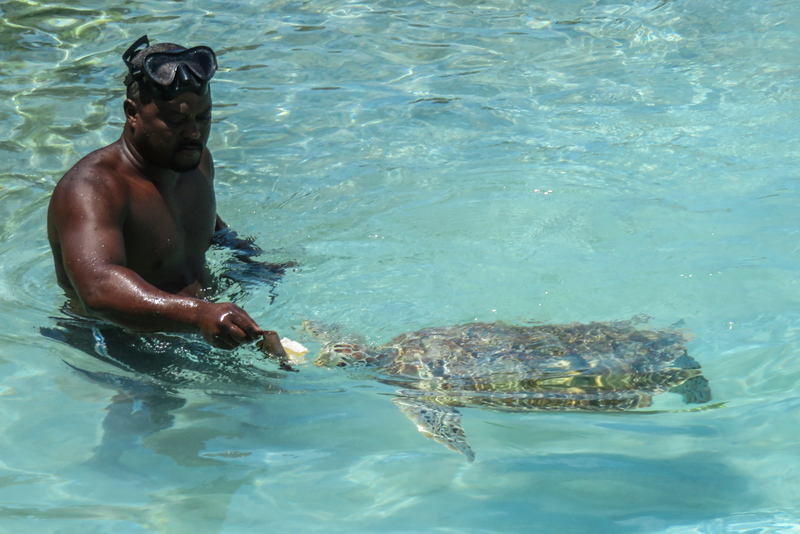 Another added bonus for the Miami to Bahamas dya trip, there is a resident puffer fish that likes to make an appearance during turtle feeding times. And gliding along the sea bed under the pier were a group of stingrays! I’m used to working around fully functioning aircraft, so it was slightly unusual to come across one sat on the bottom of the sea! 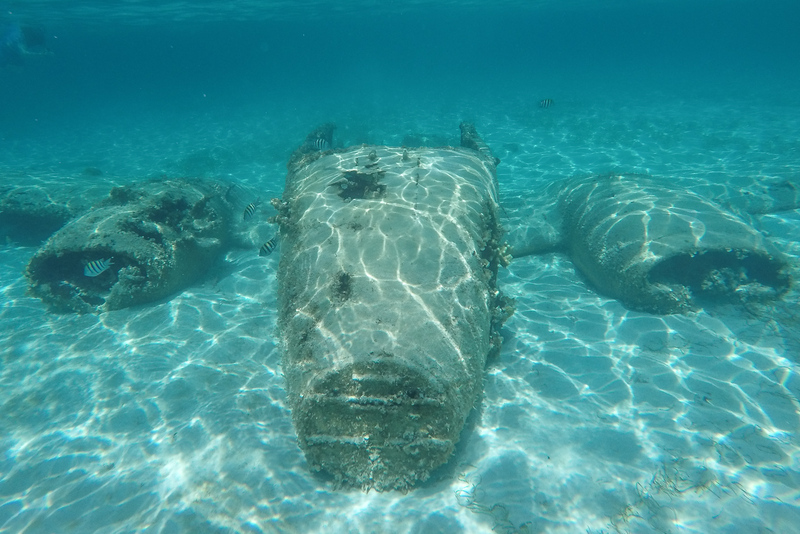 This twin engine aircraft crashed here off the island of Staniel Cay in the 1970’s. It was rumoured that it got into difficulty when it was smuggling drugs from the Bahamas to Florida. In fact, apparently they were on a practice run with bags of flour! 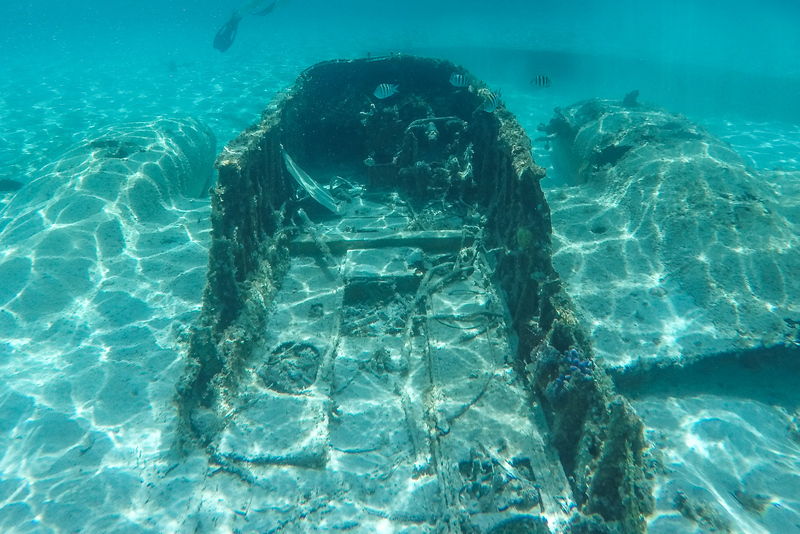 It’s yet again another one of the unique attractions to be found in the waters of Staniel Cay that will make your Miami to Bahamas Day trip extra special! At the end of the Miami to Bahamas boat excursion, it’s around 4:30pm, and we are transferred back to the airport by golf cart. Staniel Cay is a really small airport, inf act it’s really just an Airstrip. There is no terminal building, its just an outdoor pavilion. There is no ramp services or fuel. There is no air traffic control tower. 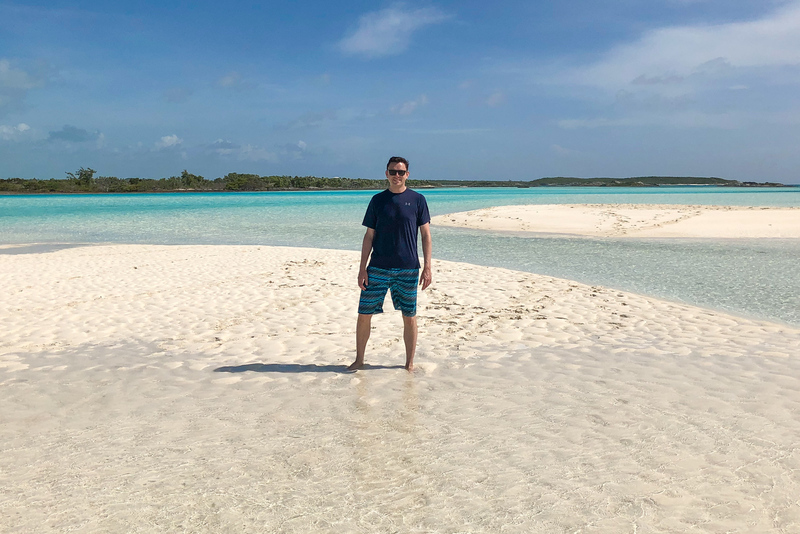 It really is as remote as you can get in these Bahamas Islands! But that really adds to the sense of adventure that this Miami Day Trip brings to life in you. From Staniel Cay it’s a direct flight back to Miami as they get customs pre-clearance approval which avoids the stop back on Andros Island. There are times in life nowadays when our expectations rarely seem to be smashed or even barely met. But this epic Day Trip to Bahamas from Florida went above and beyond all my expectations. In fairness, I have visited Staniel Cay a number of times, including on my Pilots in Paradise Island Hopping adventure by plane last year. But this Day Trip adventure was different, for starters I wasn’t flying the plane this time! From the private air terminal check-in to flying VIP style in the private Cessna Grand Caravan I felt like a rock star! 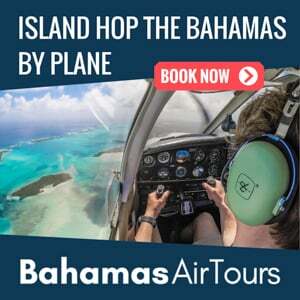 The pilot and tour guide were very attentive to the needs of the group and the whole team at Bahamas Air Tours have great customer service. This needs to be on your top list of day trips from Miami. It’s a great concept; Miami to Bahamas and back in a day. There really aren’t any other comparable tour offerings in Miami. There is a Day Trip to Bahamas from Fort Lauderdale by Ferry but it’s a gruelling 3 hour crossing by water. It’s by far more budget orientated, but please read their trip advisor reviews, they are truly shocking! Where as the Miami to Bahamas Day Trip by plane is a 5-star experience. If I could give it 7-stars, I would! The plane, boat and all the equipment they use is brand new and expertly maintained. I’ve stayed in Miami and Southern Florida many times. As an international traveller with only a few days to a week to visit Miami it’s just not practical to venture off to the Bahamas for a few days. 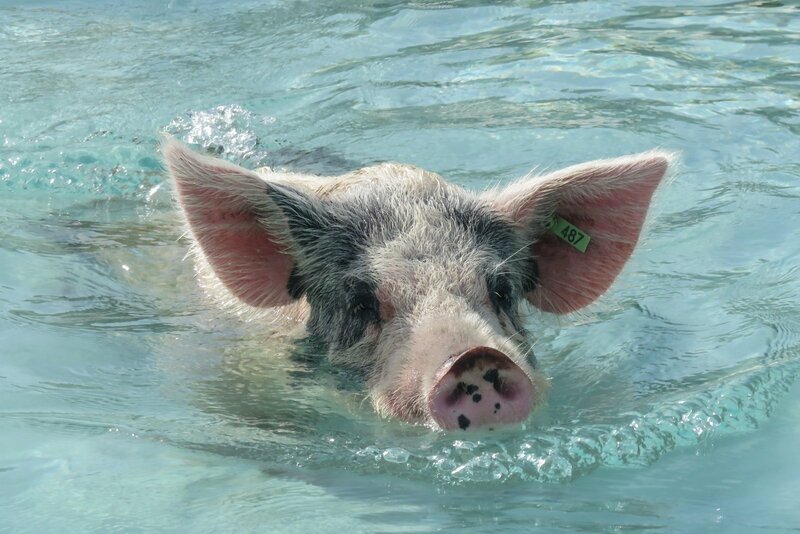 When you consider that trying to get to the Swimming Pigs from Miami would take at least 3 days, via Nassau; the Miami to Bahamas Day Tour is so appealing because you get to do all the main attractions there in a day, and return back to your hotel on south beach or wherever that may be. 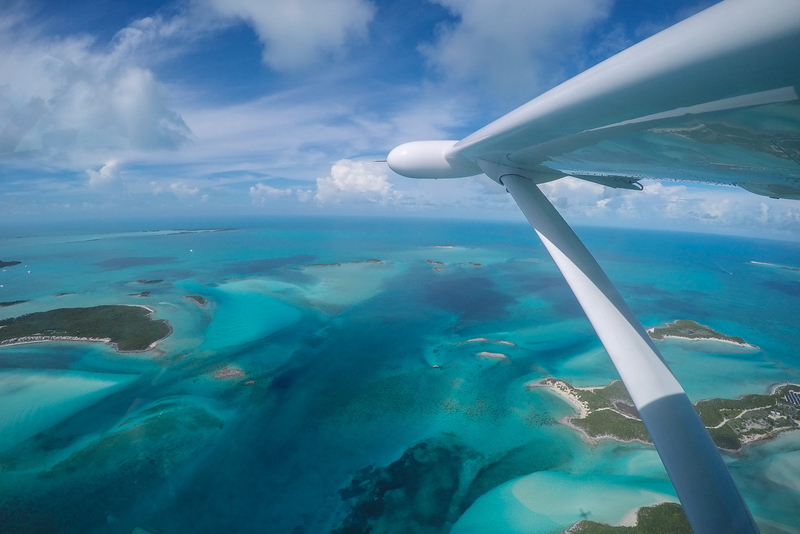 Keep your camera out as there are some stunning views as the aircraft takes off from Staniel Cay. We see all the Staniel Cay attractions from the plane window, including a fly over of Thunderball Grotto and Pig Beach! It’s important to point out that this Miami to Bahamas Day Trip actually departs from a small airport in north Miami, an area known as Fort Lauderdale, which is a separate metropolitan area in it’s own right. The Miami Day Trip to Bahamas departs and arrives back into Fort Lauderdale Executive Airport. How long is the flight from Florida to the Bahamas? It’s a 1 to 1 and half hour flight from Miami to the Bahamas. From Miami to Staniel Cay is 1 hour and a half in total. 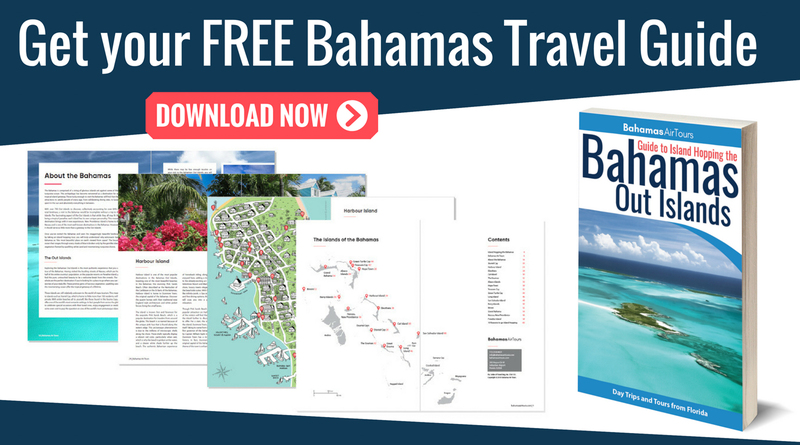 Do you need a Passport on a Bahamas Day Trip? Yes! 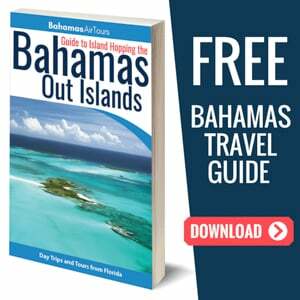 The Miami to Bahamas Day Trip is an international flight so requires you passport for entry into the Bahamas Immigration aswell as re-entry back into US immigration. Check out our guide to the top things to do in Miami!